This Jewish Apple Cake is a wonderfully dense and moist cake batter studded with tons of cinnamon-sugar coated apples. It’s the perfect fall dessert for any occasion! I know that fall doesn’t OFFICIALLY begin until next Friday (September 22nd), but I’m totally in the camp that once Labor Day is in the rearview mirror, all bets are off on apple and cinnamon and hot chocolate and jeans, hoodies, and blankets. Bring it all on! I’m ringing in apple season this year with this absolutely spectacular Jewish apple cake. It was sent to me last summer by a reader, Linda, who said she had been making it for years and that it’s a big family favorite. Thank you, Linda, for sending this amazing recipe over! 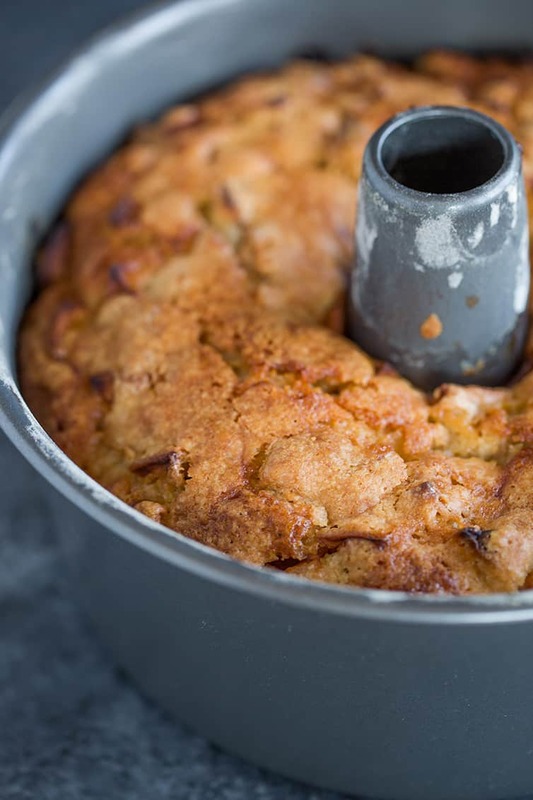 There are countless recipes for Jewish apple cakes floating around online, and you may have your own version, but if you’ve never tried one, this is an absolutely phenomenal apple cake that’s perfect for any fall occasion. You start with a TON of granny smith apples (perfect if you plan an apple picking trip!) and toss them in sugar and cinnamon. While they’re taking a cinnamon-sugar bath, mix up the cake batter. The mixing method is a little different, as you add the eggs last, and it’s a thick batter, but trust me, this works! When Linda emailed me the recipe, she said that she intentionally “ribbons” her batter in layers over the apples without covering them completely so that the cake has apples all throughout and not distinct layers of cake and apple. 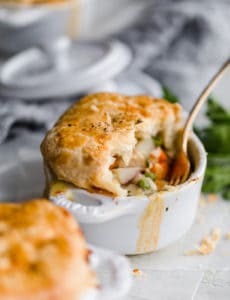 It totally worked with mine (as you can see), and I just loved having chunks of apples in every single bite! The crumb of this cake is compact but OH SO velvety smooth and super moist. Linda talked about how much her family loved the crust on this cake and I agree – I think it was my favorite part! 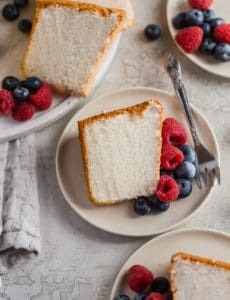 The texture of the cake really reminded me of the Russian pound cake that my aunt and grandma used to make around the holidays (I need to resurrect that cake!). Linda said that this particular recipe is from Chef Robert Bennett of Classic Bakery in Cherry Hill, New Jersey; when I Googled “Jewish apple cake” I found tons of recipes nearly identical to this one, so it may be one of those recipes that has been floating around in grandmas’ kitchens for decades! 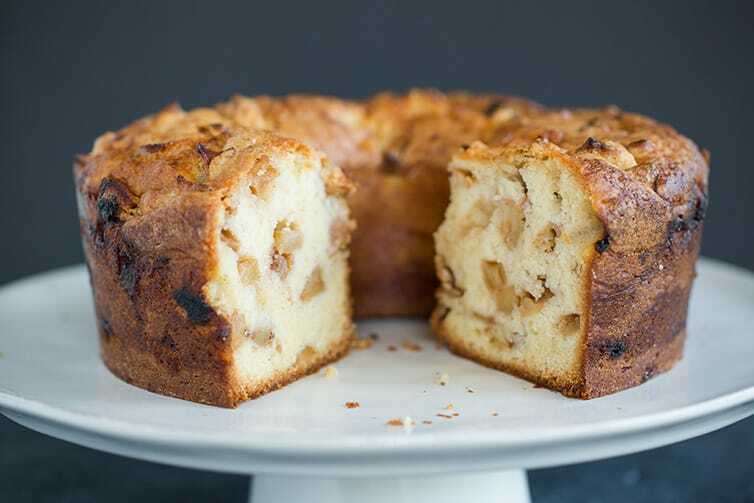 If you need something a little extra special in the dessert department this fall, give this Jewish apple cake a try – it’s dessert comfort food at its best. And if you have your own recipe for Jewish apple cake, I’d love to hear how it’s similar or different to this one! Tell me all about it! This Jewish Apple Cake is a wonderfully dense and moist cake batter studded with tons of cinnamon-sugar coated apples. It's the perfect fall dessert for any occasion! Preheat oven to 350 degrees F. Grease and flour a 10-inch tube pan. 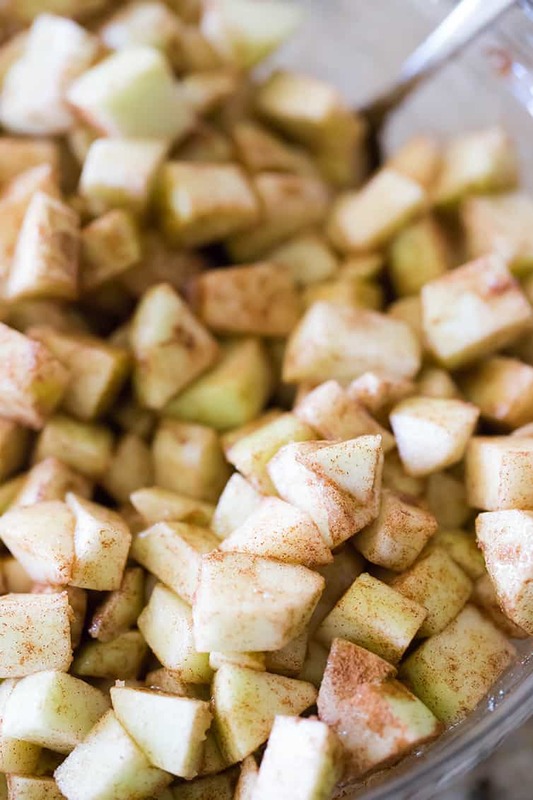 Prepare the Apples: In a large bowl, toss the chopped apples with the sugar and cinnamon. Set aside. Prepare the Cake Batter: In a large bowl, whisk together the flour, baking powder and salt. In a medium bowl, whisk together the sugar, vegetable oil, orange juice, and vanilla extract. Add the wet ingredients to the flour mixture and stir to combine with a spatula or wooden spoon. Add the eggs to the mixture one at a time, mixing well after each addition (the batter will start out very thick, but will get looser and easier to mix as you continue to add the eggs). Scrape down the sides and bottom of the bowl to ensure that all of the ingredients are fully incorporated. 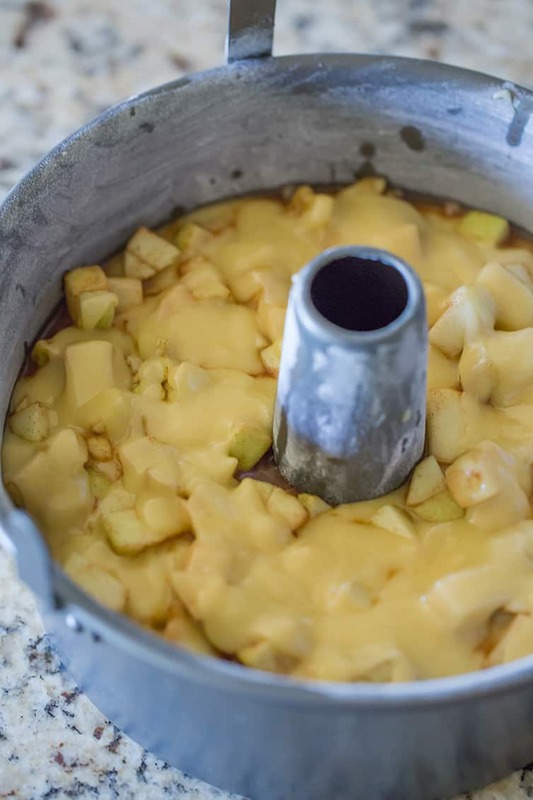 Add a thin layer of the cake batter to the bottom of the pan, then add one-quarter of the apples on top of the batter. Ribbon one-quarter of the remaining cake batter over top of the apples; the batter should not completely cover all of the apples (it will spread when baking). Repeat three more times with the remaining apples and cake batter, ending with a layer of cake batter, but again it will not totally cover the apples, that's okay! Bake for 1 hour 30 minutes, or until a skewer inserted into the center comes out clean. Cool to room temperature before serving. Leftovers can be stored at room temperature for up to 5 days. I used a slotted spoon to transfer the apples so that not too much juice transferred, but there still was some and it didn't appear to negatively affect the cake at all. You could also use a standard-size Bundt pan if you do not have a tube pan. Hi Michelle, I was looking for an apple cake that didn’t have any butter and that’s when I found your website. I made this apple cake today and it’s delicious. It’s very similar to my mom’s Italian apple cake. I guess in every nationality we each have their favorite apple cake recipe :-) Thanks so much for the recipe. This Jewish Apple Cake recipe is excellent. The taste was very close to my mother’s recipe. I’ve made it twice now and the second time I reduced the sugar to 1 • 1/2 cups. The cake was moist and very flavorful. Less sweet makes it a nice cake to have with coffee or tea in the morning. I used a tube pan and used bakers spray to coat the inside. No trouble at all removing the cake. This cake is amazing! Followed recipe exactly. Used a bundt pan. 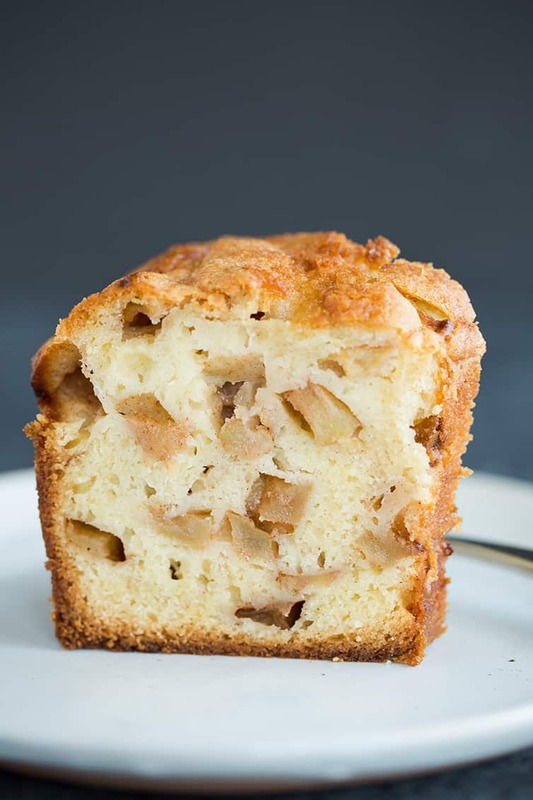 It’s been years since I’ve had a Jewish apple cake and after seeing this recipe, I really want to try it! I thought this cake would be a departure from the usual for Xmas. However, despite being an experienced home baker & following your recipe exactly, (even used the exact pan you did), the cake was very difficult to release. When I could finally unmold it, 25% stayed in the pan. This meant I could not possibly serve it to guests. Also, I thought the cake was way too sweet, but that, of course, is a matter of personal taste. Where did I go wrong? Many thanks & happy holidays. This was the best apple cake I’ve ever baked! I didn’t layer the apples with the batter. I sliced my apples and mixed them into the batter. So moist and so delicious! Absolutely the BEST. I changed the OJ to Meyer lemon juice because I didn’t have orange juice. It was fabulous. I only baked mine about 50 minutes, not 90, but this may have taken less time to vabake because I used a tube pan. Rave reviews from all who ate it. Can this cake be made in advance and frozen ? Hi Daveda, Yes, this cake freezes well! This was delicious! I could almost have reduced the sugar because it was quite sweet. But it was absolutely delicious. I halved the recipe and made it in a 9″ round pan (reduced cooking time to approx. 45 min.) The apples were so tender and wonderful. I also used some Fuji apples a little past their prime instead of Granny Smith — perhaps that’s why I could have reduced the sugar a bit. Terrific, easy recipe. I’ll definitely make this again. Dont know what went wrong but, batter was so thick could barely get it off the spoon. Had to drop globs of batter over the apples.